Page orientation is the way in which a rectangular page is oriented for normal viewing. The two most common types of orientation are portrait and landscape. The specific word definition comes from the fact that a close-up portrait of a person's face and upper body is more fitting for a canvas or photo where the height of the display area is greater than the width, and is more common for the pages of books. Landscape originally described artistic outdoor scenes where a wide view area is needed, but the upper part of the painting would be mostly sky and so is omitted. 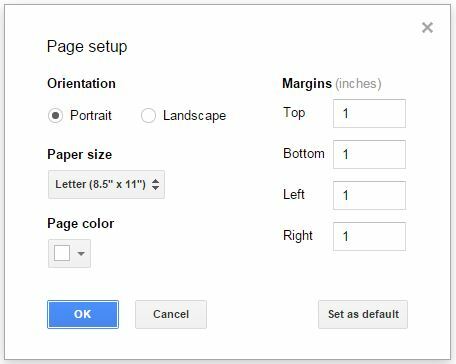 To change the page orientation within google docs, click on "File" then "Page Setup" and there you will be able to select portrait or landscape.